Dr. Philippe Touchard, an anesthetist, is head of emergencies at the Pasteur Hospital in Langon, near Bordeaux. Forty-eight hours after the January 12 earthquake, he flew to Haiti to reinforce MSF’s surgical teams in Port-au-Prince. Here are exerpts of his journal of this short mission. “We arrive at the border at 4 a.m. Two hours later, we are finally let through, and the nightmare seems over. But we pile into another humanitarian aid traffic jam, and find ourselves snared up in a convoy of nearly 200 vehicles organised by the United Nations. We inch our way forward at three kilometres (1.8 miles) an hour. At some point, one of our trucks is stopped without us noticing, and we are separated, without any news. Then another truck breaks down. We finally reach Port-au-Prince on Monday at midday, with three trucks out of five, even though we need every one. And then our taxi breaks down. “I didn’t know that Trinité hospital was in ruins, like almost all the others, and that we were working in the street. The first surgical teams, who’d arrived two days before, have been operating for about 18 hours a day. We operate on wooden tables, in the heat, with the noise of the generators in the background. Night falls at 5 p.m., and the light fails, so we carry on with head torches for another six or seven hours. The conditions are really dire, but we have no choice. Each procedure has to be carried out that day, to avoid the onset of gangrene. Fortunately I have everything I needed for anaesthetics and pain management. The pharmacy was in another building that hadn’t been destroyed. It’s complicated and frustrating not having all the equipment at hand. I saw a tetanus case, a child of 10 years old. She was convulsing on the first day, and stiff, with spasms, by the second. Tetanus is hard to treat if you're not properly equipped. You need to administer a sedative to relax the patient, and then monitor her really closely, as her breathing can stop. This patient was on oxygen, and we monitored her as best we could, but it was a hit-and-miss affair. We needed a properly equipped intensive care unit, where there weren’t so many risks. The worst, the most annoying thing, was that we had breathing apparatus in the cargo plane, but as we’d been delayed, it wasn't yet installed. I heard afterwards that the little girl had been transferred to another, better equipped facility, so she’s sure to still be alive”. “There are a fair number of us, six surgeons and five anesthetists. But it isn’t too many. Two teams work in the two operating theatres, carrying out two or three amputations a day, and also procedures on limbs that have been already amputated. They pose three or four external fixtures for stabilizing the open fractures. Another team takes on 10 to 15 dressings a day; they have to be changed every 24 hours at most. They are major dressings, and often need changing under general anaesthetic. Then there is the care in the surgical ward, and triage. We take in new patients every day. All the medical staff has the right reflexes, which is hugely precious in massive emergencies like this. 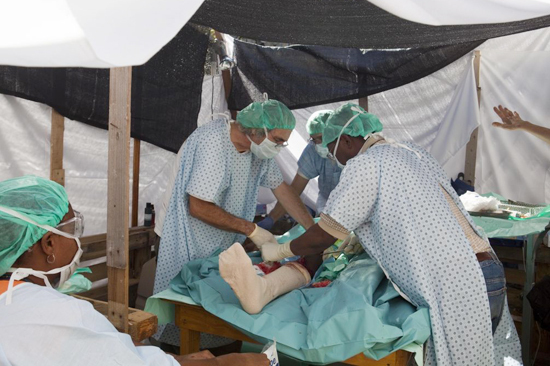 For example, when a patient refuses an amputation, we leave the Haitian Trinité medical staff to explain why the procedure is necessary, to reassure him or her. They soon bring patients around to the idea, speaking to them in Creole. As Trinité was a trauma center, we'd already dealt with this type of situation. The staff is trained to take the patient’s consent into consideration and manage this sort of difficulty. We also set up systematic vaccination against tetanus in the casualty unit, integrating protocols into the care, which means that despite these horrendous conditions, we can maintain medical quality. “I worked for four days, instead of six or seven, because of the landing permission refusals. But I don’t regret coming here. On the medical front, my mission counted a great deal; we were dealing with critical emergencies. And on top of that, it meant a lot to me to work with my former team, to find them again after all they’d been through. I didn’t find it easy at first. I wondered who was alive, who was dead. I dreaded asking the survivors questions about their families. But a deep feeling of solidarity soon gained the upper hand.